In the fall semester of 2006, one of Norton Pease's graphic design classes spent a week learning the basics of Adobe InDesign. Our assignment was to make a simple text layout, play with headings, columns, footers, that sort of thing. For no particular reason that I can remember, I typed "The Filthy Lucre" at the top of a page layout, in a big chunky serif font. Days earlier I had been reading the wikipedia article on Mexican printer/artist José Guadalupe Posada, so I made a hastily vectorized version of one of his Calavera engravings and made it into a header. I wrote a couple of goofy articles, stole part of an article from The Onion, and turned it in to my professor. He loved it, and half-jokingly suggested that I print up a batch and hand them out. I replaced my name with a pseudonym, took three bucks over to the library, made thirty one-sided copies, and left a little stack by the door of MSU-Northern's main class hall. By the next day, I had seen half a dozen students and faculty carrying or reading one. A different another professor asked me if I knew anything about it, and said he hoped I would make more. From there, the Filthy Lucre took on a life of its own. I had included an email address in the footer, and by the third issue I was getting several letters a week from students and faculty; fan letters, criticism, and some tips about shady administrative dealings going on behind closed doors on campus. Apparently people liked the idea of an anonymous, sarcastic, underground publication being produced solely for a Northern audience, and were using it as an outlet for their concerns and frustrations. I published ten more issues during the 2007 spring semester, and started including articles from several other individuals, some known to me and some anonymously contributed. By the fall of 2007, the university administration had started paying attention to us. The semester's premiere issue was critical of the administrators' decision over the summer break to close down the campus daycare without any comment or announcement. They started confiscating and destroying copies of issue 2.1; it took us a couple of days to catch on, and it was actually kind of exciting, gratifying to know that we were having an effect on the atmosphere at our campus. 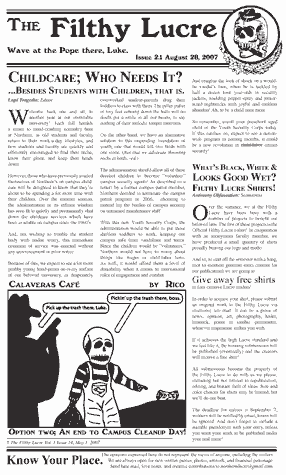 We responded by recruiting half a dozen Filthy Lucre fans (bribing them with Lucre branded t-shirts, previously made with a generous donation by a professor) to personally hand out two hundred copies of the next issue across campus, cutting off our opponents' ability to stifle us. This led to a brief struggle between the Filthy Lucre and members of the university administration, before the chancellor realized the shaky legal and constitutional ground their behaviour was on, and told them to stop. In 2008 I built an intentionally primitive looking website to house the Filthy Lucre issue archives, loosely inspired (tongue in cheek) by the Drudge Report's design. By this point a colleague and I were also hosting the Filthy Lucre Funtime Radio Hour, a weekly broadcast from KNMC, the local college station. I sporadically published a few special issues after graduating, and publically released the logo, old content, and layout template on the Lucre website under a Creative Commons license. 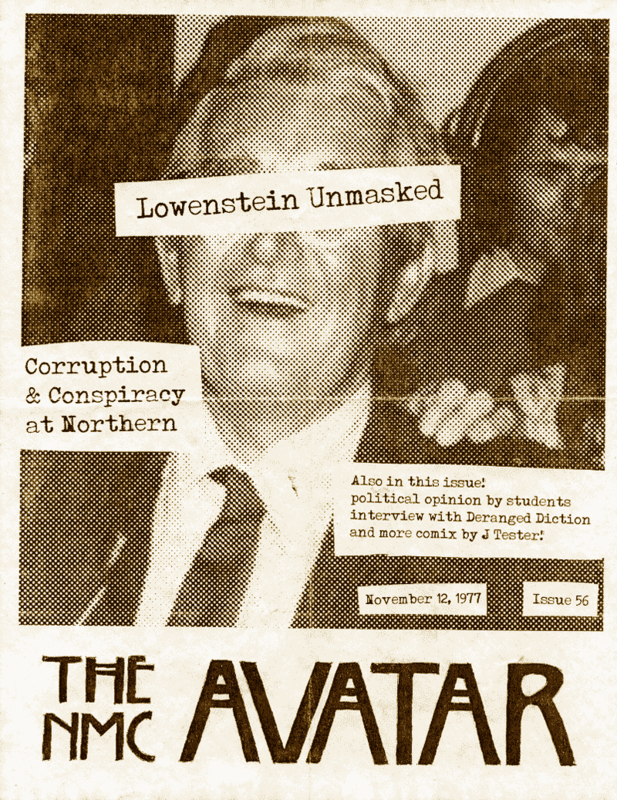 In the fall of 2009, a new batch of Northern students took up the daily operation of the Lucre, and continue to publish their own version today. I still run the Filthy Lucre Funtime Radio Hour with a friend, and occasionally participate in other Lucre-related activities. All in all, it's been an entertaining learning experience in terms of design, typography, politics, and more. The Lucre website is still operational, and you can read pdf copies of every issue. Cover for a fictional 1970s underground magazine, created for the Filthy Lucre. At one point the Lucre started promulgating the idea that our small college campus has been the home of nearly a dozen different underground newspapers over the decades. 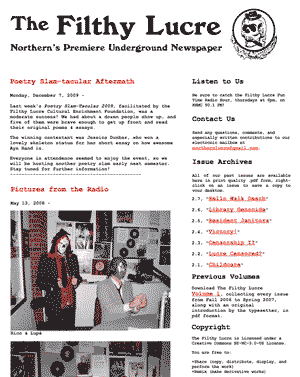 The NMC Avatar was described in some detail as a kind of proto-punk 'zine; the references to the band "Deranged Diction" and now-State Senator Tester are historically plausible, if untrue. 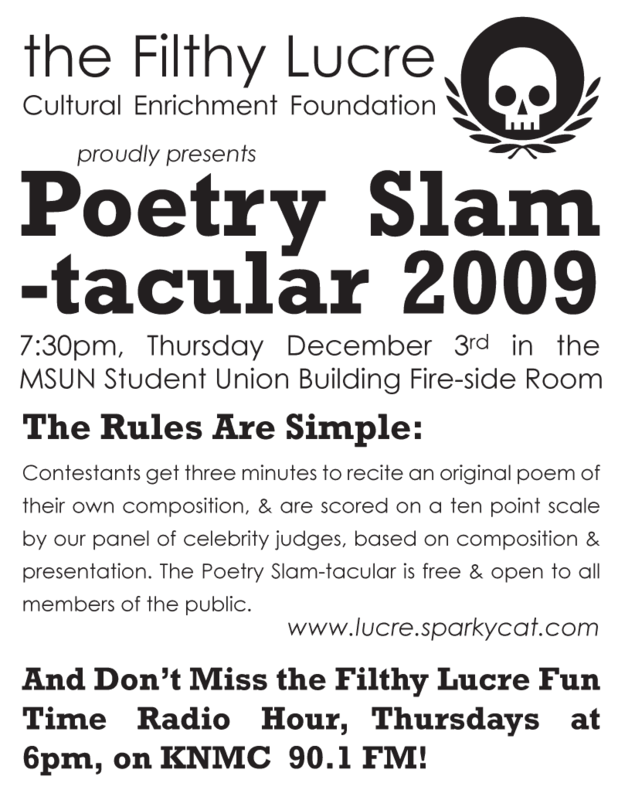 Poster for a "Filthy Lucre Cultural Enrichment Foundation" event. The Foundation is a somewhat ironic storefront for any culture-related events we put on or promote: poetry readings, movie screenings, things like that. I needed a logo that resembled the traditional Filthy Lucre logo but with a more classy, modern feel.